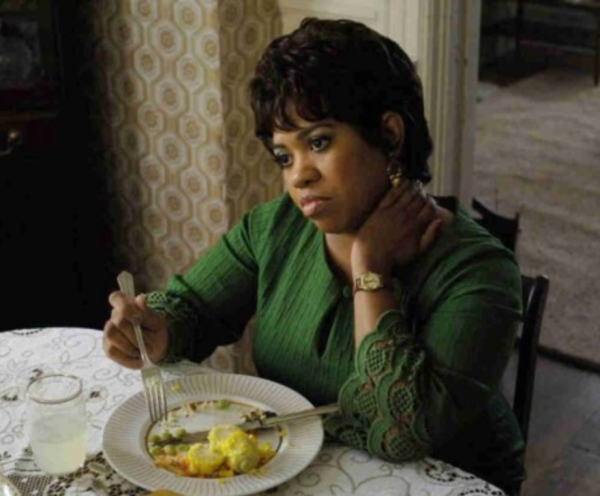 August 15, 2014 Chandra Wilson has been entertaining audiences as a star of Grey’s Anatomy for years and now fans can catch her in Frankie & Alice, out on DVD this week. CocoaFab caught up with the talented actress to get the scoop on the film, the upcoming season of Grey’s Anatomy, and working with Shonda Rhimes. She co-stars alongside Halle Berry and Phylicia Rashad in the film about a woman with multiple personalities. “The presentation was ‘Halle Berry is doing a film and she wants to know if you’re interested in playing the sister and Phylicia Rashad is playing the mother,” and I was good. That’s all I needed to say yes,” she says. Chandra says mental illness is a subject that more African Americans should pay attention to and she’s glad that she has had the opportunity to shed light on the often overlooked issue. “We are fortunate today that we have names and labels for things that didn’t use to have that kind of identity in the past. People just fell between the cracks for being labeled for ‘behavior’ issues instead of realizing something could really be going on that needed to be addressed and could lead to a better quality of life for these individuals,” she explains. She also got a chance to tackle the subject as Miranda Bailey on her hit show, Grey’s Anatomy. “I was really excited about that storyline and continue to be. When you’re talking about mental illness, there’s a progressive nature to it. It manifests in one way at one point and then it may manifest in another way at another time,” she says. She also weighed in on what it has been like to work with Shonda Rhimes for eleven years and how it feels to be one of the first leading black women she created for the small screen. “It has been such an interesting progression of how we got to where we were. Prior to season 3, I don’t think anybody knew what Shonda Rhimes looked like. Certainly not that she was a black woman unless they were really paying attention,” she says. According to Chandra, her character’s role has had a significant impact on the show’s audience over the years. She also says there are still big things in store for the show when it returns this fall. “What’s really exciting about going into Season 11 is we’re ahead of the pack when it comes to social media. The Grey’s cast is slowly but surely moving into it and there’s going to be a new social media movement with that Thursday block. From ‘Grey’s’ to ‘How To Get Away With Murder’ where we can interact with our audiences during those three hours,” she says. As far as her character goes, Chandra says she never tires of her role as Miranda Bailey. “Miranda never gets old to me. There’s always something new I’m being made to discover about her. Her journey isn’t finished yet and there’s still stuff for her to do. Roles like this don’t come along very often,” she says. Frankie & Alice is available now on DVD.